Ever look around and see someone who seems to be doing better, experiencing more peace and joy, earning more . . . someone who always seems to be getting the right breaks, is making a bigger impact for Christ, finds more favor with God, and on and on? In a word, they seem like “super saints.” Or maybe you think you have seen this person staring back at you in the mirror? There are no super saints! Never have been . . . If you will allow me a moment of personal confession, in many of my ministry efforts it is all too easy for me to take my eyes off Jesus and put them on myself and think that I am more than I am. In those moments, I am so thankful that God has given me a partner in ministry – my beloved wife, Kay – who reminds me I am no super saint – and that the church we serve is Christ’s church, not mine! What a precious gift from God – to have a wife who is not afraid to kindly but firmly tell her husband like it is . . . over and over and over again! Evangelist D. L. Moody once quipped, “I’ve had more trouble with D. L. Moody than with any other man I’ve ever known.” Thomas à Kempis advised, “Be not angry that you cannot make others as you wish them to be, since you cannot make yourself as you wish yourself to be.” When G. K. Chesterton was asked what was wrong with the world, he promptly responded, “I am!” Honesty is truly the best policy, especially when it comes to being honest with ourselves! When we acknowledge our true condition – great sinners in need of an even greater Savior – we begin to approach the place where we can be used by God. Regardless of what we are doing for God, we are only doing it because He has given us the strength to do it. Our next breath is a gift from God. Our next heartbeat is a gift from God. Our next step in the direction of advancing our service to our Savior is a gift from God. Daniel testified that “God . . . holds your breath in His hand and owns all your ways” (Daniel 5:23). Everything is a gift from God, and when we understand this truth, we see ourselves for what we truly are: weak, utterly dependent creatures. We join David in his cry, “Incline your ear, O Lord, and answer me, for I am poor and needy.” (Psalm 86:1).
. . . And that means there are no super saints! Keeping this truth before you at all times will do two things. First, if people may regard you as some sort of super saint because of your character and service before God, receive the compliment with all humility – even with a measure of fear, for the Bible says in Proverbs 27:21, “The crucible for silver and the furnace for gold, but a man is tested by the praise he receives.” (Proverbs 27:21). Give all the glory to God! Second, if you are quite sure that no one regards you as a super saint, because of your lack of ministry and service to God, remember that you are just as valuable to God and needed by God as everyone else! Answer this question: How many extra Christians has God made? The Bible says in Ephesians 2:10, “For we are [God’s] workmanship, created in Christ Jesus for good works, which God prepared beforehand, that we should walk in them.” You are a vital member of the body of Christ. Pouring all your gifts, talents, and abilities into the service of your Lord will cause all the boats in the harbor to rise; refusing to do so diminishes us all. So . . . since there are no super saints in the service of our Savior, what are you waiting for? God never calls you to do something without equipping you to do the work. You have the greatest reason and motivation in the world to do all God is calling you to do: “While we were still sinners, Christ died for us” (Romans 5:8). You are free to simply put in what you have – all that you have – and leave the results to God. Do you know what the world’s greatest labor-saving device is? Tomorrow! That’s right; why do today what you can put off until tomorrow, right? Notice that it is not the fearful who cry, “There is a lion outside,” but rather the lazy. Why? Because they’re lazy! The sluggard creates all sorts of reasons in his mind for his inactivity. Rebellion always finds its reasons, and what better reason for being lazy than a lion? You see, deep down the sluggard knows that his laziness is a bad thing and that he will receive no sympathy – and certainly no reward – for his procrastination. But who could fault someone who postponed his work because there is a lion on the loose, looking for someone to devour? OK, perhaps you have never actually talked about lions, but . . . have you been making any excuses for not doing what you know you ought to be doing at home, at work, or for your church family? Scripture is piercingly painful in its description of our procrastination: “As a door turns on its hinges, so a sluggard turns on his bed.” (Proverbs 16:24). There will always be a lion for the lazy to rationalize laziness. We all have a tendency to put off what we ought to do in order to do what we would rather do. So how do we overcome this tendency? We stay focused on the Lord, rather than the lions! Think about this truth for a moment: Jesus was born to die. He came into this world to pay the price for your sins and mine with His precious blood. Our Savior could have said, “There is a lion crouching at the door,” because there really was one – Satan, the roaring lion, who would stop at nothing to disrupt and destroy our Lord’s perfect purpose. Yet even though Jesus knew that pressing on meant that He would die the most horrible of all deaths, He rejected the way of the sluggard. The Bible declares in Luke 9:51, “He steadfastly set His face to go to Jerusalem.” Jesus just kept pressing on in His amazing work of love and grace. This is what the Bible means when it says we are to keep God’s mercy in view. God’s mercy is both the motive and motivation to put aside procrastination and set our hearts to do what we have been called by God. a gift from God available now! Remember, even if there truly was a lion outside, it should not keep us from doing what God has called us to do. As disciples of our Lord Jesus Christ, we are to be devoted to Christ. That devotion may lead us down lonely paths of pain and persecution, but what better road to travel than the one that our Savior travelled before us – the road that makes us more like Him! The dictionary defines the word desire as a “longing for something; to exhibit or feel desire for something; to express a wish; craving, yearning that impel one to the attainment or possession of something; often implies strong intention or aim.” We all have countless desires throughout the day. Desires determine the clothes we wear and the food we eat. Desires determine how we spend our leisure time and where we allow our thoughts to dwell. To stop desiring is impossible, but when it comes to our walk with the Lord Jesus Christ, we find ourselves facing what I call “dueling desires” moment by moment. Our desires place us smack dab in the middle of two kingdoms in conflict. We have the desire to expand the cause of God’s kingdom and we have the desire to expand the cause of our own kingdom. We have the desire to serve the kingdom of The One and the desire to serve the kingdom of one. We have the desire to serve our blessed Creator and the desire to serve ourselves. The primary problem we face is our desire to serve our own little kingdom is in direct conflict with the One who has saved us to serve Him. The world, the flesh, and the devil battle all day long to capture the desires of our hearts. They make alluring and attractive promises, but in the end they simply cannot deliver on any of them. They leave us poor, blind, and empty. They promise peace and deliver turmoil. They promise fulfillment and deliver despair. They promise life and deliver death. So how do we win the battle of these dueling desires that rage inside of us? Through the Gospel, of course! Only the Gospel has the power to dislodge an inappropriate desire and replace it with one that pleases God. The Gospel not only impacts our desires, it also empowers our disciplines. The Gospel is both the motive and the only enduring motivation to keep us consistently seeking after the things of God. Only the truths of the Gospel can free us to desire the things of God from our place of acceptance – not for our place of acceptance. If our desires are rooted in what we will ultimately get from God, we will eventually turn away from Him, because we will be devoid of any lasting joy. But if our desires are rooted in what we already have been given by God, the joy of the Lord will be our strength to keep on keeping on (Nehemiah 8:10). Let me close with a little story that wonderfully describes the inner battle of “dueling desires” and how to win that battle each day. On this side of heaven, we will always struggle with the battle between two desires; we can either feed the good, God-centered desires or the bad, self-centered ones, knowing the one we feed most will win the day. It’s Not About Being Good…It’s About Being His! He saved you to make you His! And out of the Gospel-truth of being His, good behavior and good works naturally flow! Our goodness flows out of our relationship with Jesus Christ. There is nothing within us that causes goodness or contributes in any way to our producing it. Once Jesus saves us, and makes us His, He stays with us through the long haul. Jesus promises in Matthew 28:20, “Behold, I am with you always, even to the end of the age.” (Matthew 28:20). When we understand this Gospel-truth, we no longer have to keep trying to work our way into His continued acceptance. Our acceptance is based not on what we do, but on what Jesus did on our behalf. “Work harder and do more!” is the slave driver’s pitiless cry to the Christian who has not yet been seized by the truth of the Gospel grace. These miserable saints fail to realize that by working to prove their love for God, or to pay for the love He lavishes on us, they are more tightly focused on themselves than they are on God! And this is precisely what the devil wants God’s people to be doing. The dominating forces driving these individuals are guilt and fear. They feel guilty over their past and fearful about their future. They look back and see the countless times they fell short of God’s mark and are consumed by an overwhelming sense of indebtedness. They believe they must repay God in some way for all He has done for them. To be blunt, they feel they need to buy God’s love. They look ahead, fearful about a future that will be marked by not measuring up (that is, not proving their love for God) and suffering the consequences delivered by the hand of a God who will inevitably come looking for a little payback! In other words, they believe God is going to “exact His pound of flesh from them.” When we mistakenly base our relationship with Jesus on our good works, we live lives of quiet desperation and utter despair. Does any of this resonate with you? The way out of this mess is by going deeper into the Gospel of grace. All others religions say, “DO!” Only Christianity says, “DONE!” Because of what Jesus has done for you, you don’t have to fixate on what you are doing for Him. It is only when we see our salvation as being more about whose we are rather than what we do that we will begin living a life that is pleasing to God and a joy for us. Good works flow out of an understanding that, even without them, I am still loved and accepted in Christ. Not What You Do … But Why You Do It! Did you know there is an obedience that is revolting to our Omniscient God? It is obedience that is done simply for the sake of obedience. It is done out of fear of the consequences of not doing something. It’s done out of guilt and obligation and duty. Or it is done out of a desire to receive some reward in return. This is not the kind of obedience Jesus rendered to His Father, and it is not the kind of obedience we are to render either. Because Jesus was perfect, we see perfect obedience as an obedience that is desired – obedience that is delighted in. Jesus did what He did because He both desired and delighted in pleasing His Father. It was never enough for Jesus simply to do the right thing. His obedience was never rooted in fear, guilt or a desire to gain some reward. He did the right thing for the right reasons. His outward obedience was firmly rooted in an inward desire and delight to do His Father’s will. It sprang from a heart that was beating with a desire and delight to please His Father in heaven. Jesus delighted in His obedience, even His obedience on the cross, and that should make all the difference in the world to us. Jesus delighted in taking our sin. He delighted in taking our guilt. He delighted in taking our punishment. He delighted in taking God’s wrath! He delighted in taking our death. Can you truly wrap your mind around all of that? And when we fall short of the mark, we rest in the truth that we are clothed in His righteousness . . . not only forgiven by the Father, but delighted in too! If it is you who is the “star” of your story, your story is MUCH too small and will always leave you dissatisfied and unfulfilled. When you think about it, it really is silly to view ourselves as the star of our story. From beginning to end, Jesus Christ is the star of our story, because our story is wrapped up in His story. Our lives begin and end with Him, He who is the Creator of all things (John 1:3) and the Judge of all men (2 Corinthians 5:10). Jesus showed up as the Star; He saved us as the Star; and He calls us into His story to acknowledge Him for who He is and what He has done as the Star. We acknowledge Jesus before men when we make Him the Star of our story. And as the Star, He gets top billing, He receives the headlines, and He gets all of the accolades. We need to remember that if it wasn’t for Jesus there would be no glory in our story! It would be a story only of total depravity, terrible destruction, and a timeless, terrifying death. Regardless of where this finds you – whether you are riding the crest of the wave or the waves of challenge are crashing over you – it’s all about Him. Every success is about Him, and every season of struggle is about Him . . . whether we like it or not! So . . . who is the star of your story? Who is writing the final few chapters? When all we do is done for His glory, Jesus is the Star who stands at the center of our story, a story that can be summed up in a word: GLORY! We’ve all heard the sardonic expression, “THE HONEYMOON IS OVER!” Although it is used in a variety of contexts, from business to sports to politics, the phrase refers to the disappointing truth that the wonderful, even fantasy-like beginning of a marriage, marked by happiness and unimaginable optimism, has now settled into the relentless burden of “doing life” together. In my pre-marriage coaching sessions, I always emphasize that couples not to do what most people do, which is spending far more time planning the wedding than they do the marriage. This will help keep the “honey” in the marriage. Notice that Isaiah did not say that the bridegroom rejoices over His bride only during the initial honeymoon phase. Rather, it is a mark of the Master’s unchanging nature (which He reveals in Numbers 23:19 and elsewhere) that He always rejoices over His beloved bride. It’s a HOLY HONEYMOON from the moment we are raised from death to life in Christ; it continues throughout our lives; and it will go on for all eternity! Because God is infinite and unchanging and we are His bride, the honeymoon is never over. I remember the incredible joy Kay and I experienced on our honeymoon back in August of 1973. We didn’t have much, but we had each other and it was a wonderful period of uninterrupted time spent together. However, whatever joy . . . whatever pleasure . . . whatever excitement . . . whatever “magic” Kay and I experienced together on our honeymoon it is only a shadow of the experience that will come when we are received into glory by our Bridegroom! So . . . how should this Gospel truth impact our lives? It should cause us to rest in our redemption, knowing that our God is rejoicing over us! It should lift us when we are low, strengthen us when we are weak, comfort us when we are anxious, and give us unwavering hope when we are hurting. Oh, what a Bridegroom we have in Jesus! The list of blessings, of course, is virtually endless. Indeed, the Bible says in Ephesians 1:3, “The God and Father of our Lord Jesus Christ . . . has blessed us in Christ with every spiritual blessing in the heavenly places.” Having been given new life, cleaned off, and brought into the family of God, we simply cannot plumb the height and depth of the blessings that we have received in Christ. But we must remember that the Christian life is not an endless parade of balmy days and delightful, cool breezes. We will spend days on the other side of shadow of the cross, where the sky is sometimes dark and stormy, and a scorching sun beats pitilessly down on us – on that side of the cross is suffering. And in that suffering we also need to live, and live well, as a witness to the One who hung on that cross in our place. To be sure, it is always easier to live in the shade of the shadow of the cross. This is the place where we find the sky is always blue and the clouds are always fleecy. But on the other side of the shadow we find suffering . . . and this is part of taking up our cross and carrying it for Jesus. 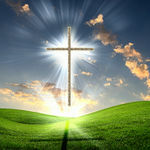 The cross is not only our greatest source of blessing, it is the source of our heaviest burden. Jesus was a cross-bearer, and all those who would follow Him must be cross-bearers too. If we will one day receive a crown, it will only be by way of the cross. The Via Crucis, or, the Way of Sorrows, is the only way to the place of blessing; it must be walked by every follower of Christ. Jesus carried His cross to the Hill Golgotha to be crucified and to die upon it. Will we not submit and surrender our shoulder to our cross to be purified on our way to eternal life? If you keep the promise of the glorious life to come in view, your present burden will be greatly eased. Jesus willingly gave Himself to a cross He did not deserve. God forbid that we would shrink back from the cross that had our name carved into its side. To know the Father’s love – a love that gave His only Son to be nailed to the cross to pay for all our sins – is to know enough to receive our cross as a badge of holy honor. The apostle Paul’s prayer was that he would . . .
Paul believed it was an honor to share in the sufferings of His Lord, because Paul knew what His Lord did for Him on that cross. He knew “the incomparable riches of [God’s] grace, expressed in his kindness to us in Christ Jesus” (Ephesians 2:7-8). He stood in the glorious shade of the shadow of the cross on the road to Damascus, and in that moment when Jesus raised Paul from death to life, Paul stooped to surrender his shoulder to the glories of its suffering too. Paul wanted nothing more than to be like Jesus . . . To live like Jesus . . . to suffer like Jesus . . . and to die like Jesus! The more deeply we understand the Gospel, the more delighted we are to carry our cross. Both blessing and burden live beneath the cross, and it is the call of every follower of Christ to take it up daily, regardless of the cost or circumstance. Think about this truth for several moments . . . God knows everything about us and still delights in accepting us fully and completely. He knows all our . . .
And He knows every one of our sins, each one an affront to His holy, righteous, just, and perfect character. Yet in spite of being fully known for the broken sinners we really are, if you have accepted Christ as your Savior, God has accepted us in Christ without placing any conditions upon His acceptance. WOW! Can you think of anyone in your life right now who, if they knew everything about you, would accept you as freely and fully as God does? Imagine a video of your last 30 days of your life being played before your closest friends and family members – every action . . . every word . . . every thought . . . every desire . . . being played on the big screen for all to see. Now that’ is a thought which could take your breath away, isn’t it? What would everyone think about you after watching that video? What would they do with you? Yet the God of the universe knows all the details of your life – the good, the bad, and the downright ugly – and He still accepts you fully and completely. What a friend we have in Jesus! Think about the times you’ve debated with God like Job, denied God like Peter, and doubted God like Thomas. And yet even in your debate, denial, and doubt, God never stopped accepting you with a love that is as total as it is transforming. But it doesn’t end there! Because we are fully accepted, we are to accept others, even those we consider unacceptable. Those we dislike we are to accept. Those we judge we are to accept. Those we avoid we are to accept. Those we condemn we are to accept. Those we disagree with we are to accept. Jesus told us, “Love your enemies and pray for those who persecute you, that you may be sons of your Father in heaven. He causes his sun to rise on the evil and the good, and sends rain on the righteous and the unrighteous. If you love those who love you, what reward will you get?” (Matthew 5:44-46). To be sure, we cannot do any of this in our own strength. That is why we need the power of the Gospel pumping through our veins. As we deepen our understanding of the acceptance God grants us in Christ—in spite of how unacceptable we really are—we are empowered to accept others . . . all others. GOD’S GRACE GIVES: PARDON . . . POWER . . . PROGRESS! Paul was explaining the “effect” of the grace that was given to him. God’s grace strengthened Paul for the ministry God had set before him. You can see that Paul was not boasting in himself when he wrote “I worked harder than all of them,” because he immediately added “yet not I, but the grace of God that was with me.” Paul boasted in the power that had been given him for his provisions progress, and power for living and ministering which was rooted in the grace of God poured out into his life. Sadly, many today only see God’s grace as freedom from the penalty of sin. As amazing as that grace is, the Word of God makes it clear, in the above verse and elsewhere, that grace is also freedom to make progress against sin and to live a life of holiness and obedience to the Lord. Now, don’t think for a moment I am suggesting you will reach a state of sinless perfection! That will only happen on the other side of the grave. But I am speaking about the power to make progress in the pursuit of the life God has called us to live. The grace that saves by faith is the grace that sanctifies by faith and it is never without effect. To be sure, every Christian will live the painful truth set forth in the seventh chapter of Romans; we will struggle against the old, sinful nature. But God’s grace will never be without effect; the Christian is empowered to advance in holiness and live a life that is honoring to God. And is there any better life to be living? Absolutely not! So . . . what kind of effect has God’s grace had on your life? Is God’s grace evidenced in your personal relationships? At home? At the office? In your thought life? In your ability to express your emotions in an appropriate way? Remember, once God’s grace pardons you, it unleashes His power in you to make progress, as you grow by faith in Christ-likeness “in the strength which God supplies, that in everything God may get the glory” (1 Peter 4:11) as you journey toward your eternal home.